Founded in the year 1976, at Delhi (India), Scientific & Technological Equipment Corporation is reckoned as the high profile manufacturer and supplier of Material Testing Equipments. We are offering a product range that is made by making use of state of the art technology and at the same time conforming to the BIS and ASTM standards. Our vast range of products encompasses Cement Testing Equipments, Pulverizer & Jaw Crushers, Road Testing Equipments, Bitumen Testing Equipments, Concrete Testing Equipments, Soil Testing Equipments, Testing Sieves, Compression Testing Machine, Mineral Testers etc. Our wide collection of products is well acclaimed for high functional efficiency, immaculate design and resistant to corrosion and abrasion. Even though our company is confined to domestic markets, we are also exerting our best initiatives and look forward to enhance our business horizons to international markets in the near future. We are put in place a well structured infrastructure that assists us to adhere to the changing market trends through extending inventive range of products. Our expert and experienced team of professionals look after the entire production process and strive hard in the development of our array of material testing equipments through their skill in the respective domain. In the process of assuring the quality of our range, our team of Quality analysts undertakes several quality tests in conformity with internationally approved quality norms. Also, we offer our products at industry leading prices and cater to the specific requirements of our clients. Under the constant direction of our mentor, Mr. Ashish Tiwari, we have been able to attain a predominant place in this competitive industry domain. With his business acumen, expertise and industry experience, our company has been able to meet the organizational goals. Manufacturing and Exporter of Cement Testing Equipments, Pulverizer and Jaw Crushers, Road Testing Equipments, Bitumen Testing Equipments, Concrete Testing Equipments, Soil Testing Equipments. 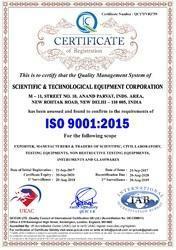 We remain a quality focused organization and hence, we have deployed a well structured quality management system. In order to attain our quality aims, we try to manufacture our wide range of Material Testing Equipment adhering to the BIS and ASTM standards. For a sustained up gradation of quality, we undertake self-appraisal against different globally certified standards and norms in our quality inspection wing. Our quality section is administered by a team of skilled and devoted Quality controllers that regularly inspects the whole manufacturing process, right from sourcing of the raw materials to the dispatch of the consignments to clients in a time bound manner. We hold a competitive edge over our rivals in the market, due to our highly skilled and experienced team of professionals. They strive hard to comprehend the specific needs of clients and deliver the products accordingly. Our team possesses deep knowledge in this field of production that assists us to innovate new range of products in tune with the shifting market trends. The team consists of Engineers, Technocrats, Quality controllers, R & D personnel, Warehousing and packaging professionals and sales & marketing staff. The entire staff works in close coordination to achieve the objectives of our organization.